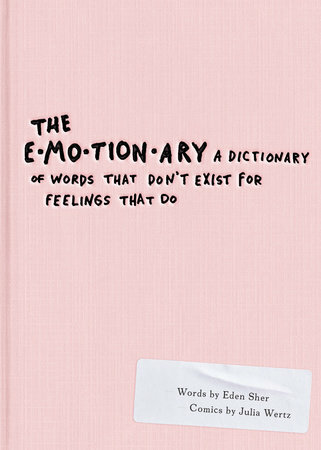 A dictionary of words that don't exist for feelings that do written by The Middle actress Eden Sher and illustrated by acclaimed graphic novelist Julia Wertz. All her life, Eden Sher has suffered from dyscommunicatia (n. the inability to articulate a feeling through words.). Then, one day, she decided that, whenever she had an emotion for which she had no word, she would make one up. The result of this is The Emotionary, which lives at the intersection of incredibly funny and very useful. Chock full of words you always wanted/never knew you needed, often accompanied by illustrations of hilarious and all-too-familiar situations, The Emotionary will be a cherished tool for you or the world-class feelings-haver in your life. At long last, all your complicated feelings can be put into words, so you can recognize them for what they are, speak their names aloud, and move on. Finally!